Our pools open! Let the swimming begin. Similar to birthdays, we celebrate the Fourth of July for an extended period. This year it started even earlier since our park had a party the weekend before the holiday. Games, musicians, aquarium touch tanks, fire trucks, crafts....just to name a few things. Love the Fourth and love CCP (Christopher Columbus Park)! Although the kids had to go to school through the end of June, they spent the time on field trips. This one was tide pooling to Lynch Park in Beverly. Who doesn't want to spend the day at the beach digging in the sand for sea glass and critters! Richard's class was lucky enough to have a school trip to the State House. We got to see every room with personal tours from our Senator and House Representative. It was pretty amazing! They got to touch things, sit in their seats, go out onto the balcony in the front of the building and check out the Governors Office. We all learned so much (I am now realizing how much I forget from school!). Well once we got past the kid who wondered where the steak was because he thought we were going to the steak house!! I love these kids and the opportunities they are getting to grow and learn. We had an awesome weekend in Monroe visiting with cousins and old friends. My best friend Juliane flew in for the reunion so we were all able to hang out. The kids haven't seen each other since last year, but it never matters. We also got to celebrate our buddy Olivia's birthday. It is nice to have good friends around the country! And so fun that my kids are friends with my old friend's kids (does that even make sense??). Since we were in NY for my high school reunion, the kids and I went with Babci to the Bear Mountain Zoo. This is a great little place with local rescued animals. It was a beautiful day to enjoy the walk through the zoo and the rest of Bear Mountain park. We finished the trip with a picnic lunch on the lake and of course the playground. 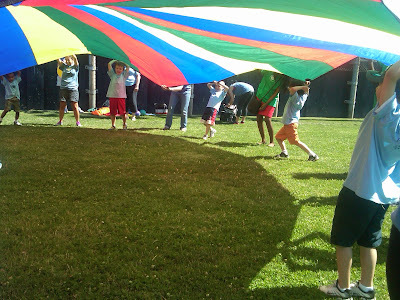 Field Day is Rich's favorite day of the year at school. I mean instead of doing any work, you go outside and play sports with your friends, on the water (and eat hot dogs)!. Sounds perfect. I had to work so I couldn't go, but Chris did. They both probably preferred it that way! Finally a dry Red Sox game! This one was at the end of a long day for Ang so she just took a little nap. Nothing better than the Red Sox with friends. The Eliot's last performance of the year was again at the Great Room in Faneuil Hall. I know I say it every time, but these city kids really get some great perks! I don't remember what our kids sang, and I can't find the video of it but it was a fun, special day! Angela got a new bike for her birthday from Babci. 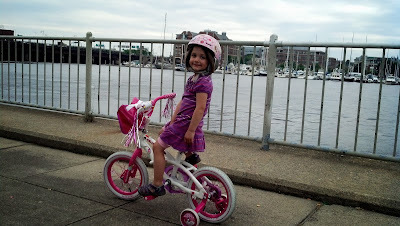 Here's to her learning to ride it without training wheels soon! 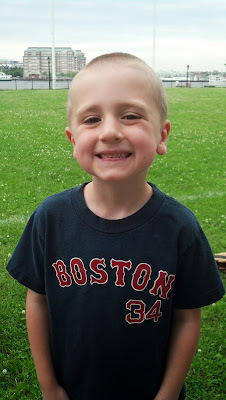 Another sure sign of summer.....buzz cuts!! We had a great Father's Day and did all things that "Dad" wanted to do. 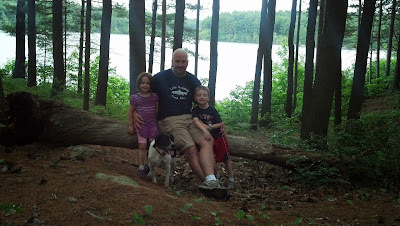 We went for a hike along the lake in the Fells, played baseball on the water and ate lots of good meals. Happy Father's Day to the best Dad out there!